There are a number of opening plays that are not recognised joseki, that make the compromised diagonal shape. When these are used in games by pros, there are some reasons. 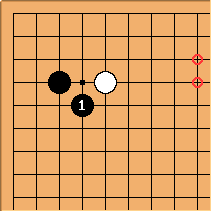 This play has uses in the Chinese opening with a black stone at one of the marked points.